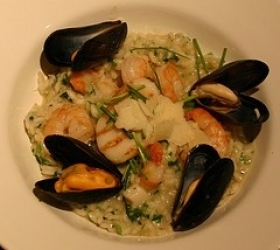 Have you made Basic Risotto And Several Variations? 1. Pick through the rice to remove any stones or foreign matter, but do not wash it before cooking. 2. Using a large skillet with a heavy bottom, heat the olive oil over low eat and saute or "sweat" the onions until translucent, being careful not to allow them to color or brown at all. 3. Add the Arborio rice, stir to coat with the olive oil, and saute with the onions to toast each grain of rice, about 7 minutes. 4. 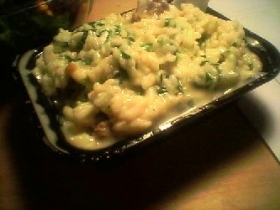 This toasting process adds the chewy, al dente quality that attracts so many people to risotto. 5. 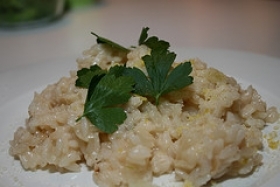 Once the rice is lightly toasted, add the white wine slowly, stirring with a wooden spoon. 6. 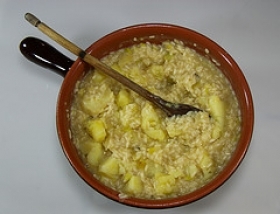 (A wooden spoon is always preferable when making risotto, as a metal spoon tends to cut or injure the grains of rice. 7. Constant stirring should be avoided for the same reason). 8. Preheat the chicken stock just to the boiling point, then have it ready at stoveside. 9. 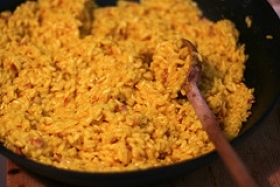 After the rice has absorbed the white wine and the skillet is nearly dry, add 1 cup stock, stirring occasionally, and cook over very low heat until the stock is absorbed. 10. Continue adding the stock, 1 cup at a time, until all the stock has been absorbed. 11. 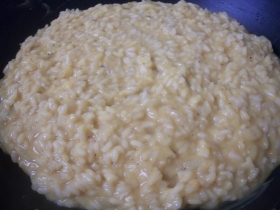 (Adding the liquid in stages, instead of all at once, allows the grains of rice to expand more fully, adding to the risotto's creamy texture). 12. Once the rice has been added to the pan, the entire cooking process will take about 17 to 20 minutes. 13. 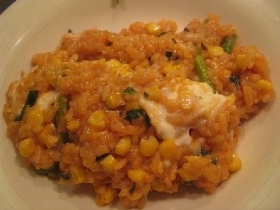 After all of the liquid has been added and the rice is chewy yet fully cooked, with a creamy texture, add the butter, Parmesan, and heavy cream. 14. Stir to combine all the ingredients and serve immediately. This recipe contains potential food allergens and will effect people with Wheat, Butter, Gluten, MSG, Poultry, Rice, Cheese, Sulfites, Onion, Olive Oil allergies.